A few words on my own personal background with meditation and how the story of the Moment Traveller came along. As I reached my early twenties back in the mid-eighties, I started getting more interested in the big questions about life ... the age-old chestnuts of ‘Who am I?’, ‘What am I doing here?,’ ‘Where is all this going?’. This curiosity led me to the School of Philosophy in my home town of Melbourne, where these kinds of questions were the main focus, and it was here that I first encountered meditation. I went to the school for several years and would always look forward to attending the weekly classes to hear inspiring words on human nature and the workings of the mind, along with group discussion of how the material presented in class had been personally experienced during the week. The emphasis at the school was very much on practical philosophy and implementing simple principles of wisdom into one’s daily life, particularly the practice of meditation. Even though I joked that I was only there for the tea and buscuits, I was very thankful that there was a place within the busy modern city hubbub where the more mystical and universal side of life could be explored and experienced. One of the most valuable things I experienced at the school was being introduced to a simple mind-stilling exercise, which involves closing the eyes, becoming more aware of the body and focusing on the sense of listening. The purpose of this exercise is to quieten the discursive chatter of the mind and connect with the senses, so as to allow a fuller connection to the present moment, and I was immediately struck by how powerful and profound this simple technique can be as a way to radically change awareness and perspective. Whenever it's been practised, there's a sense of 'arriving' or 'coming home', a returning to something larger, more authentic and somewhat magical, and thus I’ve always regarded it as a very practical and precious gift. Extending on from this simple pausing exercise, I was introduced to a longer, mantra-based meditation which was practised for half an hour both morning and night, and which laid the foundations for a regular meditation practice that continues to this day. So I’ve always been very grateful to the school for its role in pointing me towards the importance of quietening the mind and the inward path of meditation. In the mid-nineties, I also started exploring audio-based meditation programs that use brainwave-altering technology. Enlisting the combination of recent breakthroughs in neuroscience with the ability of sound to induce meditative states made sense to me, and my very first experience of this was indeed markedly memorable. One afternoon, I found myself in a particularly uninspiring mood, wrestling with a hornet’s nest of anger, frustration and despondency. Feeling a bit rattled and emotionally drained, and with a kind of “What the heck have I got to lose?” approach, I grabbed my Walkman and headphones and put on a new ‘Holosync’ program that my partner Mary had just ordered from Centerpointe Research Institute. (This program induces alpha, delta and theta brainwave states and helps to synchronise the left and right hemispheres of the brain). An hour later I was completely changed. My dark mood was totally gone, and I actually came out of the session literally laughing for no reason. This kind of experience was the motivation behind attending Centerpointe’s first Holosync retreat in Portland, Oregon in 1996, where Mary and I meditated under headphones with around 30 other people 4 to 5 hours a day for 5 days straight. (A kind of 'extreme sports' version of meditation.) It was amazing to witness the effects of this process, both in myself and the rest of the group, with all kinds of insights, breakthroughs and lucid 'out of body' experiences being reported. Around that same time, I had also begun exploring another frontier of self development through the practice of vocal toning, which involves vocalising prolonged vowel sounds as a way to explore the state-changing effects of working consciously with sound, voice and breath. I went with my partner Mary to several workshops that focused on sound healing and 'discovering the power of the natural voice', and we both found this work to be a wonderful doorway into deeper levels of awareness. The ability of toning to align the body and mind and bring one more into the present naturally leads to a deeper connection with the silence 'underneath the sound’, creating a direct link with meditation. We went on to do two Teacher Training courses in this work, as we found it such a simple, enjoyable and effective practice for bringing about noticeable transformation. So overall, most of my adult life has been characterised by this keen interest in meditation and state change. Across this journey of taking regular forays into inner realms and quieter spaces, I have regularly found myself inspired to write about my experiences with meditation and related philosophical themes. I’ve spent many hours of my life creating poems and songs on matters of the heart and mind, as I particularly enjoy using the poetic flow of ryhme and meter as a kind of ‘carrier wave’ for reflective thought. And it was in one of these writing sessions, all the way back in 1988, that the ‘Traveller’ first said hello. At the time, as a lad in his mid-twenties, I was at something of a crossroads in my life, which was actually more like an eight lane intersection. I had just moved interstate from Sydney back to Melbourne and was camped temporarily at my sister's flat with no fixed address, no job or income, no car, and and about $50 to my name. I had also recently broken my right foot in a ‘tragic dancing accident’ and was dealing with the challenges of reduced mobility due to hobbling around on crutches. On top of all this, I was playing Vincent Van Gogh in a small theatre production, and thanks to the make-up artist badly miscalculating the tint of Van Gogh's red hair, my usually conservative-looking brown mop had been dyed an ungodly shade of bright chemical orange, which made me look like I’d just stepped off a Muppets movie. So confidence and self esteem were not exactly at an all-time high, and I had absolutely no idea where I was headed or what was next. It seems to be a central theme in life that we often require the catylist of some kind of upheaval or ordeal in order to make us review ourselves and our circumstances more deeply. Whether it’s a 'thorn in a our side' or the proverbial Mack truck, adversity compels us to look again and look within, so that we can address what’s going on and learn to adapt and surmount the challenges, rather than sinking further under the rubble. As Kahlil Gibran says: “Your pain is the breaking of the shell that encloses your understanding”. So at this point in my life, with a fair bit of ‘shell breaking’ going on and the urgent need for some fresh perspective and a new direction, I found myself naturally going more often to the pausing exercise mentioned earlier, which at that stage I’d been doing for a couple of years. In an effort to tune in more to the moment and get some insight into what might be next, this mini-meditation increasingly became an ally to gaining some sense of clarity, stability and the bigger picture amidst life’s curve balls and challenges. One day, looking out of a second-floor window and taking in the sunny view of the inner city, I suddenly found myself in a very strong meditative state. Everything opened up and in the space created I overheard a line being sounded in my mind ... ”To the moment went a traveller, in search of knowledge true ...” Sensing the creative spark of a new poem coming through, I reached for the nearest pad and pen, and a couple of hours later (which seemed, as the poem says, like ‘no time at all’), I was looking at a sheaf of several pages of verse that turned out to be the genesis of the Moment Traveller story. While the poem appeared to be reasonably complete, I had a feeling that it had a bit more to say and was not quite done with me yet, and I wondered if it might turn into a longer piece and possibly a little book, particularly as I’d also found myself sketching a few drawings to go with the words. So a few months later, I made up a simple illustrated version of the poem, written out in long-hand and ingloriously bound with a corner staple. Having created this initial draft, I put it aside and didn’t go back to it for quite some time. Then, after a good many seasons had gone by, I started getting further inspirations on the poem and found that these would tend to come in waves. When I was meditating, the Traveller would sometimes whisper in my ear, and at other times a verse or two of the poem would drift into mind and hijack my pen as I was writing something else. It would arrive and then disappear again, seeming to have a life of its own, and this occasional conversation with the Traveller went on for a number of years. A bit further down the track, when the poem had grown to double its original length, I teamed up with Mary and started formating a basic book layout, adding some new illustrations and getting more of a feel for how the words and pictures would flow together. Then there was another decent-sized period where it sat on the shelf, until it was picked up once more with quite a few new verses being written that made the poem double again in size. Fast forward to 2013, and it was time to get this little epic wound up, so we put in a concerted effort over several months to nudge it across the finishing line. As the poem went through its final fine-tunes, Mary worked some of her Photoshop magic, giving the watercolour illustrations a bit of extra ‘fairy dust’ and finessing. Having finally reached the point where the book’s content and design was nailed down, we switched to production mode, and a few weeks later we happily received a visit from a courier van with several cardbox boxes from the printer containing the first print run. 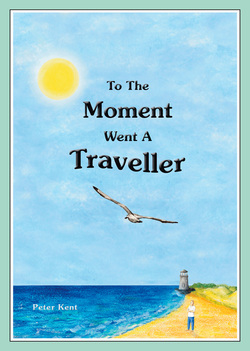 So that’s the inside story on how this little tale of the Moment Traveller came to be. I’m so pleased that the book has received such a positive response, and find it wonderfully encouraging to hear people saying how it has made them feel closer to the moment and themselves, or how a favorite line, verse or page resonates with their own experience. Knowing that people are connecting with the book is genuinely heart warming and gratifying. 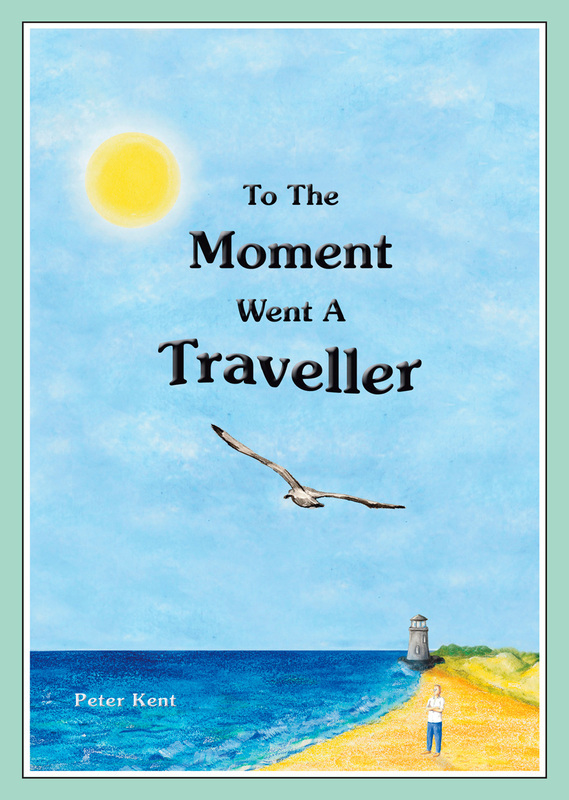 I hope that you too enjoy To The Moment Went A Traveller, and that it helps inspire you on your own journey through the wonders and challenges of life .